Gahanna-Jefferson Public Schools recently rolled out a helpline students and others can access to anonymously identify and address mental health issues and potential safety concerns before they become a crisis. 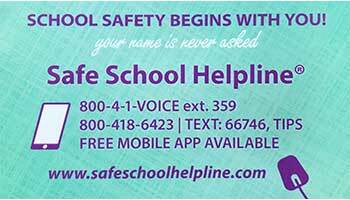 The Safe School Helpline is just one way the district is working to help resolve non-academic barriers in and out of the classroom. According to Lisa Kelley, administrator of school-based prevention and counseling, conditions in students’ lives and environments must be in order from them to be successful. The helpline came to fruition following Safety Town Hall last year, in which the topic of mental health came up several times. After hearing from the community, the district took proactive steps to establish the Safe Schools Helpline as part of a multi-faceted plan to tackle the issue. Kelley mentioned that the helpline isn’t the final step in creating safer schools. In fact, the schools regularly review and refine their safety practices and take school safety very seriously. “I am proud to be a part of a district that puts students first in every way, including in their physical and emotional safety,” said Kelley. Accessing the system is simple. Students, parents, and staff can call the hotline at 1-800-418-6423, fill out an online form, text or even download a mobile app to share information. From there, the district will follow up with any further questions, if necessary. Those who report potential issues can choose to remain anonymous if they prefer. Any information involving a situation that could be threatening to students and staff should be reported. Such situations may include thoughts of suicide or self-harm, violence, weapons, drugs and alcohol, bullying and/or theft.